Received July 22, 2018; Revised August 19, 2018; Accepted August 19, 2018. The application of molecular markers in rice breeding can allow the rapid screening in the early growth stages without phenotype screening. We developed a set of resistance and susceptible-allele specific dominant markers based on SNP of eIF4G gene associated with rice tungro spherical virus (RTSV) resistance through the allele-specific PCR procedure. The allele-specific SNP marker set was tested in F2 population derived from the cross between Unkwang and TW16-1120 and co-segregated with phenotypic data of RTSV resistance screening. This demonstrated that the SNP-specific markers of eIF4G gene can be applied for marker-assisted selection of RTSV resistance. Resistant cultivar to rice tungro disease (RTD) is an important breeding objective for rice improvement in many Asian countries (Hibino et al. 1990). Since the 1990s, a number of tungro resistance varieties have been developed by direct phenotypic screening. Green leaf hopper (GLH)-resistant cultivars were initially employed to control RTD, however, most GLH-resistant cultivars were failed to show enough durability in fields (Dahal et al. 1992). Although a distinction between resistance to rice tungro spherical virus (RTSV) and to GLH is yet to be made in RTSV-resistant germplasm sources, dozens of germplasm sources were found to be highly resistant to RTSV (Shibata et al. 2007). Meanwhile, germplasm sources practically effective to control RTSV in fields are still very limited and there is difficulty in conducting of screening because the phenotype assay is often based on the present of plants showing symptom expression (Hibino et al. 1990; Zenna et al. 2006). To identify a gene involved in RTSV resistance, the association of genotypic and phenotypic variations for RTSV resistance was examined in backcross population derived from Utri Merah and rice germplasm with known RTSV resistance. The RTSV resistance in Ultri Merah was found to be under the control of a recessive gene (tsv1). The gene was mapped to a 200-kb region (22.0 to 22.2 Mb) of chromosome 7 where a gene encoding initiation factor (eIF4G) was strongly associated with RTSV resistance (Lee et al. 2010). Several techniques including pyrosequencing, TaqMan, and high-resolution melting (HRM) have been developed to genotype SNPs. These techniques require specialized detection equipment and/or labeled PCR primers, which cost more than standard primers. Thus, a method for rapid, simple, inexpensive, and reliable genotyping of SNPs is desirable. The allele-specific PCR method meets these requirements. In principle, SNPs can be detected simply using allele-specific PCR primers with the 3′ terminal nucleotide corresponding to the site of the SNPs. An allele-specific primer matches perfectly with one allele (the specific allele) or has a 3′ mismatch with a nonspecific allele. The objectives of this study were to develop high-throughput markers linked to RTSV resistance gene and to facilitate marker assisted selection (MAS) application in the breeding. In order to validate the gene specific SNP marker of RTSV, a population of 121 F2 individuals derived from a cross between Unkwang and near isogenic line TW16-1120 containing the tsv-1 originated from the donor cultivar Utri Merah. All rice samples were supplied by International Rice Research Institute (IRRI) and National Institute Crop Science (NICS). Oligo nucleotide primers were designed, using Primer Premier Version 5.0 (http://www.premierbiosoft.com/primerdesign/). For susceptible SNP marker, the sequence of eIF4G gene was obtained from GenBank (Accession number GQ203288). For resistance SNP marker, the sequence of eIF4G gene was obtained from GenBank Accession numbers GQ203289 and GQ203290 reported by Lee et al. (2010). To assay SNPs, we used the allele-specific PCR method (Hayashi et al. 2004) where an artificial base pair mismatch was introduced within three nucleotides of the 3′ end of the primer in addition to the 3′ mismatch with the nonspecific allele (Fig. 1). Assaying a single SNP with a dominant allele specific marker was done by a pair of PCR amplifications, one with a primer specific to resistance allele and another with a primer specific to the susceptible allele. PCR amplification reaction with dominant SNP-specific markers was carried out in 20 μL containing 10 ng rice genomic DNA isolated by the rapid method, 0.5 U of Taq DNA polymerase (Invitrogen, USA), 1 × PCR buffer, 0.4 μL 0.4 mM dNTPs, 0.6 μL 50 mM MgCl2, and 0.5 μL each (10 mM) of an allele-specific primer and a reverse primer. The amplification cycle consisted of 35 cycles of 95°C for 30 seconds, 62°C for 30 seconds, and 72°C for 60 seconds. PCR products were visualized by gel electrophoresis on 2.0% (w/v) agarose gel. 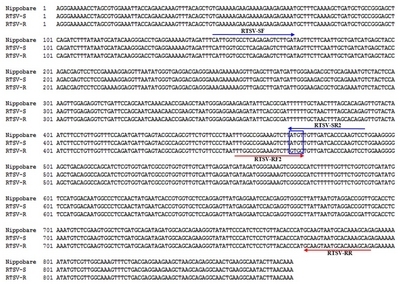 For allele-specific SNP marker, multiple sequence alignment of the tsv1 alleles was performed using the CLUSTALW program. Based on the association of specific SNP types and the reactions to RTSV infection in rice, we designed allele-specific SNP markers for tsv1 by a method described by Hayashi et al. (2004). We incorporated mismatches at various positions in the primers, since the allele-specific PCR primer containing only one mismatch may not discriminate alleles. Allele-specificity of the designed primers with mismatches was evaluated by PCR of eIF4G alleles in plants with susceptible cultivar TN1 and resistance cultivar TW16 (Fig. 1). This demonstrated SNP marker designed by the traditional method did not detect polymorphism between resistance and susceptible cultivars. Then, we incorporated a mismatch by base substitution in resistance allele (T to G) and susceptible (A to T) (Table 1). The mismatch incorporation increased specificity and discriminate polymorphism between resistance and susceptible cultivars. One hundred one Unkwang/TW16-1120 F2 individuals were genotyped with resistance- and susceptible-specific SNP markers (Fig. 2). PCR results were co-segregated with phenotypic data obtained by the RTSV resistance test with ELISA. To confirm the applicability of the markers, we compared genotypic data with two SSR markers (RM336 and RM21808) closely linked to tsv1. Results also showed a correlation between genotypes of the allele specific marker and RM21808 that an SSR marker at tsv1 locus co-segregated with phenotypic data. SNP is the most abundant genetic markers in the genome and offer a large range of applications. However, these methods require expensive equipment and development costs. A simple and cost-effective method for SNP genotyping would improve the accessibility to SNPs for all minimally equipped laboratories. Gene based SNP markers will become increasingly common as additional genes conferring agriculturally important traits are cloned, such as Pi-zt gene of blast resistance (Hayashi et al. 2004) and Xa3 gene of bacterial blight resistance (Hur et al. 2013). We present here simple and efficient allele specific SNP markers to detect tsv1-mediated resistance to RTSV. These two dominant markers will simplify MAS for this trait, as they are completely predictive of the functional nucleotide polymorphism between resistant and susceptible alleles. This relatively inexpensive technology can be used without any special equipment and is thus well suited to breeding programs in RTD prone regions. This work was supported by a grant from the Next-Generation Bio Green 21 Program (No. PJ013196022018) and was carried out with the support of “Cooperative Research Program for Agriculture Science & Technology Development (Project No.PJ011340)” Rural Development Administration, Republic of Korea. Fig. 1. Sequence alignment of the tsv1 genes from Nipponbare, TN-1 (RTSV-Susceptible) and TW16 (RTSV-Resistance). Their positions are indicated above the sequences. Arrows indicate the location of the susceptible allele (blue) and resistant allele (red) primers, respectively. Fig. 2. Comparison of genotypes between Resistance (R)/Susceptible (S) allele specific markers and two SSR markers RM336 and RM21808 closely linked to tsv1 in 121 F2 plants derived from a cross between Unkwang and TW16-1120. PCR products of R/S SNP were amplified using R/S-specific SNP markers respectively and visualized on 2% agarose gel after mixing R/S-specific SNP marker-PCR products. P1: Unkwang, P2: TW16-1120, S: susceptible, R: resistance plant. Allele specific primer set of RTSV resistance gene. Dahal, G, Dasgupta, I, Lee, G, and Hull, R (1992). Comparative transmission of and varietal reaction to, three isolates of rice tungro virus disease. Ann Appl Biol. 120, 287-300. Hayashi, K, Hashimoto, N, Daigen, M, and Ashikawa, I (2004). Development of PCR-based SNP markers for rice blast genes at the Piz locus. Theor Appl Genet. 108, 1212-1220. Hibino, H, Daquioag, RD, Mesina, EM, and Aguiero, VM (1990). Resistances in rice to tungro-associated viruses. Plant Dis. 74, 923-926. Hur, YJ, Jeung, JU, Kim, SY, Park, HS, Cho, JH, and Lee, JY (2013). Functional markers for bacterial blight resistance gene Xa3 in rice. Mol Breed. 31, 981-985. Lee, JH, Muhsin, M, Atienza, GA, Kwak, DY, Kim, SM, and De Leon, TB (2010). Single nucleotide polymorphisms in a gene for translation initiation factor (eIF4G) of rice (Oryza sativa) associated with resistance to Rice tungro spherical virus. Mol Plant Microbe Interact. 23, 29-38. Shibata, Y, Cabunagan, RC, Cabauatan, PQ, and Choi, IR (2007). Characterization of Oryza rufipogon-derived resistance to tungro disease in rice. Plant Dis. 91, 1386-1391. Zenna, NS, Sta Cruz, FC, Javier, EL, Duka, IA, Barrion, AA, and Azzam, O (2006). Genetic analysis of tolerance to rice tungro bacilliform virus in rice (Oryza sativa L.) through agroinoculation. J Phytopathol. 154, 197-203.